Through the Zombie Glass picks up a bit after Alice in Zombieland ends. Ali is still recovering from the events of the previous book, while trying to figure out how to balance her normal life with her secret life. It may not be easy, but she’s not alone. Cole, the gorgeous slayer and now Ali’s boyfriend, is making sure she stays out of trouble. However, after a particular accident, Ali starts to experience things no one has experienced before. Trying to battle the forces of darkness is bad enough. Now, Ali must battle the forces within herself as well. This book. THIS BOOK. If you remember my absolute love for book one, you’ll be happy to know that love has intensified. I can’t even begin to tell you how much I loved this one. I don’t even know where to start. Ali is seriously one of my favorite heroines. There’s just something about her that you can totally relate to. However, she’s still supernatural enough to make the storyline believable. I love her character, her struggles, her friendships, and of course, her relationship. I like how she pushes herself, how she strives to be better and protect those she loves. No matter the cost. Sure, just like any realistic character, she makes mistakes and drives you insane, but I think that just marks a well written story. She grew so much in this book, discovered things about herself and the world around her. And after all that, came out on top. Now, let’s talk about Cole. Oh dear goodness gracious, I really wanted to punch that boy in the face in this book. In a good way (yes, there is such a thing). I love him as the bad boy turned all protective and loyal. But seriously, dude, he really made me frustrated in the beginning. However, just like Ali, he grows into the kind of a person he ought to be and it was beautiful. I love those two together. They push each other. They make each other a better version of themselves. One of my favorite romances in YA right now. The story in this book is amazing. Sure, some of it I kind of expected but I really believe Ms Showalter really delivered. Honestly guys, this book held none of the typical book two mediocrity that sometimes hits in the midst of a series. It was exciting and hilarious. Frustrating and unique. I love the characters, I love the storyline, I love the covers. I wish book three was out right now so I can re-read the whole series through. Seriously, if you haven’t checked out these books yet, do it now! You won’t regret it! 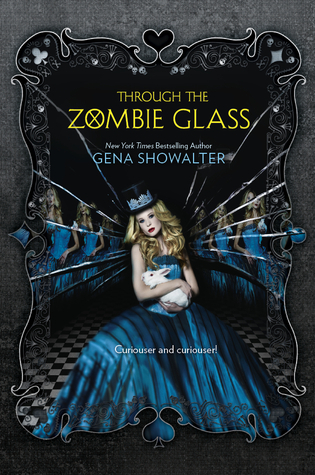 Through the Zombie Glass is out September 24th, 2013! I’d love to hear your thoughts!